The LT-20 6.5x LinenTest Magnifier from Carson Optical is a compact, fold-out loupe magnifier that is ideal for stitch counting. The 6.5x power loupe has markings in both inches and centimeters, and it folds flat when not being used. 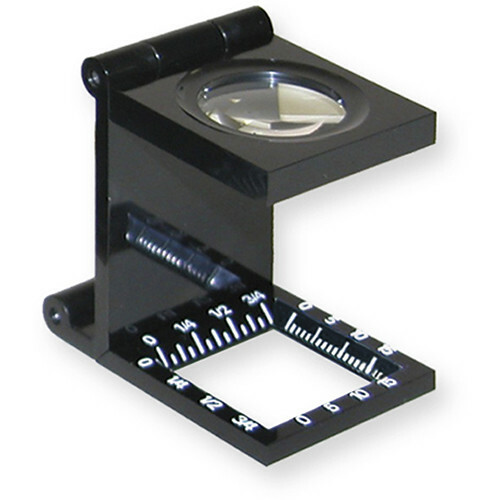 Box Dimensions (LxWxH) 2.0 x 1.45 x 0.55"
LT-20 6.5x LinenTest Magnifier is rated 4.8 out of 5 by 5. Rated 5 out of 5 by Kim the Animal Lover from Great Product for an Unbeatable Price! I shopped around on other websites for a linen tester, but found the prices at B&H Photo Video were lower. The product was just what I was looking for - small and durable with remarkable magnification and imprinted millimeter hash marks. It's perfect! Rated 5 out of 5 by Anonymous from Excellent product. Very well made. Have one that is about 50% larger, but the hinges did not have metal pins! That one keeps falling apart! The design allows placing a flashlight beam to illuminate whatever is being examined while also providing sufficient opening to actually work on the item. I use this, among other tasks, when I am digging splinters out of my skin. Rated 4 out of 5 by Dan from Good but could be bettter I love this style magnifier, but it is pretty small and cheap.? Works fine and like how it folds.? Would be better if better quality (metal vs. plastic) or better magnification (10x), but overall I would buy it again. Rated 5 out of 5 by Michael from Fun little gadget These little items are cheap enough and well made enough that every kid should get one in their Christmas stocking. Endlessly useful and amusing for just lookin at stuff. Rated 5 out of 5 by Saleh M from Very useful loupe I used the loupe to ascertain the correctness of the alignment of my phono cartridge. It is very effective in increasing the accuracy of the alignment.